We started the annual clean up/rescue of the Blueberry rows yesterday. Now that they have been in for fifteen or sixteen years they tend to mostly be forgotten and just a another part of the landscape until it is time to pick them. We mow the grass between the rows a few times a year but the birds love to sit on the branches and “deposit” weed seeds under the bushes in places that make it hard to get at. We do mulch the rows heavily every few years but this hardly stops the well fertilized weed seed. It would be OK if they were just harmless annual weeds but as time goes on it is things like small trees, and the vines that like to cover the plants like trumpet creeper, morning glory and our favorite, poison ivy. So every May, just prior to the berries ripening, we go out armed with gloves and pruners and cut out these woody invaders, mow as close as we can and maybe do a little selective weed eating. In the end it is much cleaner and pleasant for the endless hours of picking to come. Everybody has been asking when will the blueberries be at market. I went back into the records and found that the average first picking has been May 25th (Friday) but as cold as this spring has been and from what I saw yesterday I don’t think we will make it. The earliest ever was last year on the 22nd and the latest ever has been the 31st, with the exception of 1997 when we didn’t have any blueberries at all because of a very late freeze in April. That was the same year that we had frost on Mothers Day, set the lowest high temperature record for June on the 6th at 59 degrees and the record June low of 48 degrees on the 10th! I guess there can be stranger seasons than this one has been! The last of the wholesale lettuce goes out tomorrow and in general it has been a good lettuce season, we will still have lettuce for market for weeks to come but the selection becomes narrower each week. Behind the lettuce we immediately turn under the residue and have been planting more warm season flowers, the third planing of Zinnias awaits tomorrows lettuce harvest so that they can get in the ground, a week late! The field tomatoes have finally decided to hell with the cool weather it is time to grow so we had to go through and prune and tie them up to the trellis for the first time this season. Many more passes will be made over the next several months to keep them climbing up the fences. The Turkeys are three weeks old now and will get to go outside, for the day, for the first time tomorrow, always very amusing to watch. Betsy is now cutting flowers everyday and the walk in coolers are filling up and are a riot of color, it finally feels more like our normal routine. 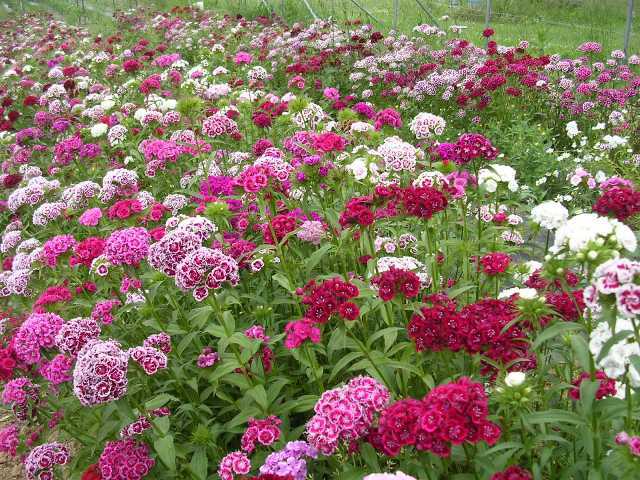 Incredible Sweet William, what a great long lasting flower!